This product release is the first of five for 2018 and the forty-first overall in the U.S. Mint’s series of America the Beautiful Quarters Three-Coin Set™. Pictured Rocks quarters were released into circulation more than two weeks ago, the same day that the U.S. Mint released bags and rolls of them in circulating quality. These are standard coins for business, although the ones in the Mint-branded bags and rolls have never circulated. proof quarter from the San Francisco Mint. These three quarters carry respective mintmarks of ‘D’, ‘P’ and ‘S’ that are found on their obverse (heads) under the inscription IN GOD WE TRUST. Proof coins tend to have greater appeal because they have frosted designs and mirror-like backgrounds. This CoinNews photo shows a closer view of a proof Pictured Rocks quarter. One of them is in each set. Designed by Paul Balan and sculpted by Michael Gaudioso, quarter reverses depict the park’s Chapel Rock and the white pine tree that grows on top of it. The three quarters are protected within a plastic card that features a scenic photo of Michigan’s Pictured Rocks National Lakeshore (www.nps.gov/piro/index.htm). The card’s back includes brief information about the park, the quarter’s designs, and the Mint’s Certificate of Authenticity. Order quarter products from the U.S. Mint’s website, right here, or call 1-800-USA-MINT (872-6468). Older quarter sets dating back to 2016 are still available. Figures show their sales range from about 12,350 to 16,400. 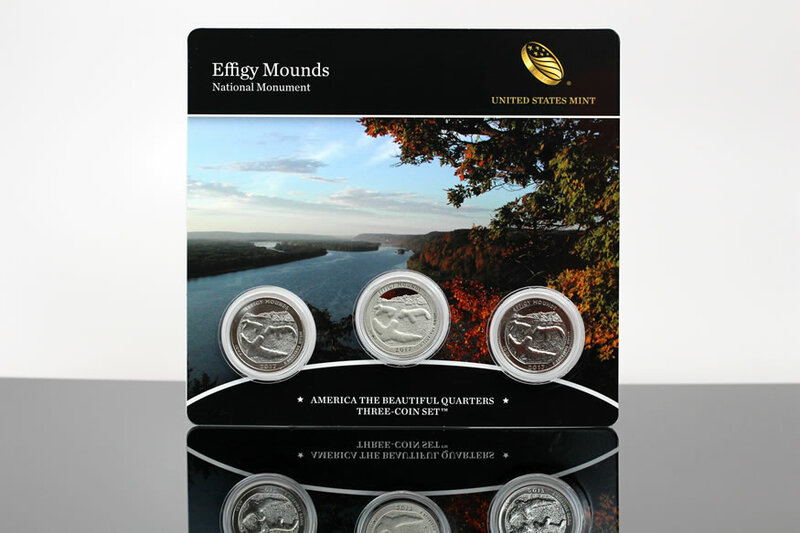 A CoinNews photo of last year’s first three-coin set with quarters emblematic of Effigy Mounds National Monument in Iowa. 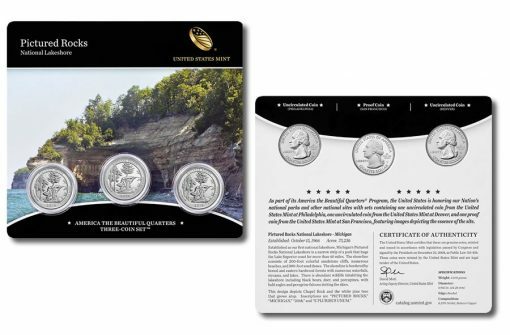 These coins are struck and issued by the U.S. Mint as part of its America the Beautiful Quarters® Program. The series debuted in 2010 and features five new quarters annually with each celebrating a different site of national interest. 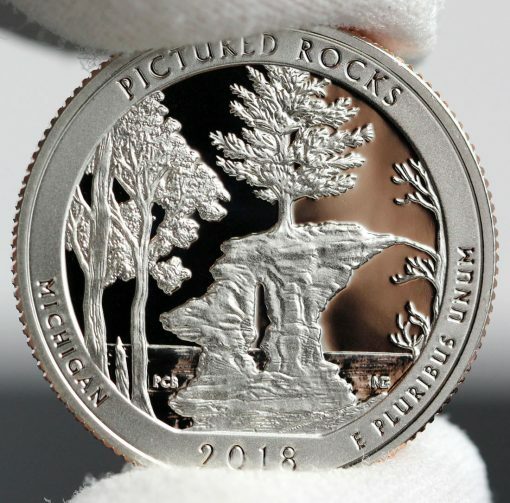 Upcoming sets for 2018 will feature coins honoring Apostle Islands National Lakeshore in Wisconsin, Voyageurs National Park in Minnesota, Cumberland Island National Seashore in Georgia, and Block Island National Wildlife Refuge in Rhode Island. This particular ATB quarter is one of the most striking yet in the series. What an awesome depiction of nature at its most fascinating! Old Collector – this coin reminds me of something my RCM would put out. Great coin design. Thank you. I take that as a very generous compliment to our Mint, as I am quite aware of how artistically proficient, even magical, the RCM’s own products can be. Old Collector – I am very impressed with some of the designs coming out of the US mint lately. Nice to see healthy competition out there among mints. Great for all of us collectors. Choice and quality product is a good thing. The only thing I never want the US mint to change is the Buffalo – it is by far one of my most favorite designs / timeless and never needs to change. Pure beauty. The Mint can’t change the depiction of the Buffalo since it would be akin to altering Abraham Lincoln’s time-honored visage in the sense of being just as much of an artistic sacrilege.